Bangladesh Inland Water Transport Authority (BIWTA) on Wednesday pulled down some 282 illegal establishments along the Buriganga River in the capital and the Karnaphuli in Chattogram. In the capital, the BIWTA mobile court bulldozed as many as 252 structures along the Buriganga River from Islambagh to Loharpool. The drive began around 10:30 am and continued till 4pm. On Tuesday, some 200 illegal establishments, including a three-storey building, were demolished at Nabancharon. The eviction drive will continue until February 19. The BIWTA in its previous eviction drive on January 29-31 removed some 444 illegal establishments along the Buriganga River. It identified 609 illegal establishments, including 56 multi-storey buildings, on the banks of the Buriganga, the lifeline to the capital, from Sadarghat to Gabtali area and these are being evicted in different phases. According to UNB’s Chattogram correspondent, a total of 30 illegal establishments were dismantled along the Karnaphuli River on the third of the drive. With this, a total 140 structures were bulldozed in three days and five acres of land were reclaimed in Sadarghat Lighterage Jetty, Majhirghat, Anu Miar Majhirghat, Laban Ghat and adjoining areas. 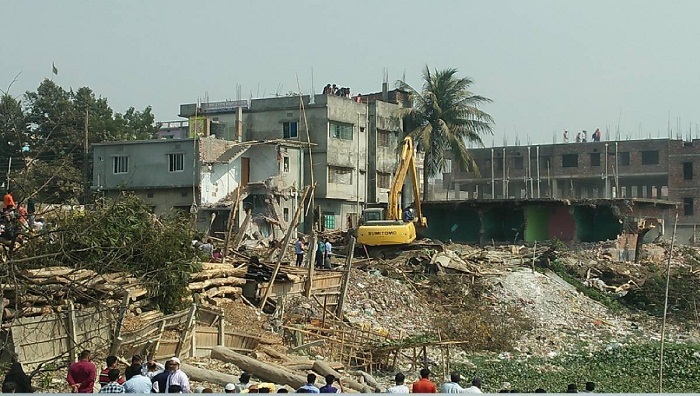 Among the demolished establishments, there were 52 salt factories, said executive magistrate and assistant commissioner (land) of PatengaTahmilur Rahman. A team, led by the magistrate, started the drive in Sadarghat Literage area around 10 am which continued till 4pm. On Tuesday, the local administration bulldozed some 80 illegal establishments. Tahmilur Rahman said the total area stretching from Chaktai to Patenga has been divided into three zones to make the eviction drive easier and a total of 2,187 illegal establishments will be bulldozed. Around 200 structures stretching from Sadarghat to Barik Building area will be removed in the first phase, he said. Fire Service, Chittagong City Corporation (CCC), Chittagong Development Authority (CDA), Rapid Action Battalion (Rab) members and police are taking part in the eviction drive, the AC (Land) said.